June is National Safety Month, and the personal injury attorneys of Hardy, Wolf and Downing want to remind parents and caregivers to keep an eye on children anytime they are in or around water. According to the American Academy of Pediatrics, drowning is the second leading cause of injury and death for children five years of age and younger. Although relatively rare, parents should also understand the signs and symptoms of dry drowning (also known as secondary drowning), which can cause a fatal chain of events within the body that can rapidly lead to death. Although the majority of drowning deaths occur in swimming pools, children also drown in bathtubs, wading pools, buckets, and even toilets. 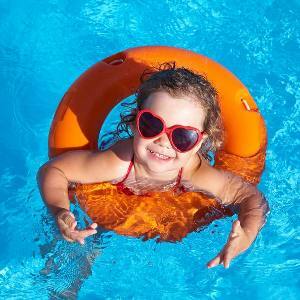 Drowning deaths and injuries happen in an instant, and occur in as little as one inch of water. Many parents mistakenly believe that they would “hear” warning signs of a child in distress (because their child would splash or cry out). But pediatricians and safety experts caution that drownings often go undetected precisely because they happen quickly and without a sound. Although younger kids are more vulnerable to drowning, parents shouldn’t relax their stringent safety standards as their kids grow older. Children who learn how to swim are not immune to drowning or injuries, and all children require proper adult supervision around water. Safety experts suggest that adults who are responsible for supervising children around water give them their undivided attention. Ideally, parents should put away electronic devices, books, and other distractions when supervising kids who are swimming or playing in or near the water. Everything else can wait- your child’s safety is far more important than any Facebook status update or that new book you’re reading! In 2008, parents across the country were shocked by the tragic death of a 10-year-old South Carolina boy who died more than an hour after he went swimming for the very first time with his mother. Earlier that day, the boy’s mother said he had an accident in the pool and got a small amount of water in his lungs. But when they left the pool together and walked home that afternoon, and the boy seemed fine. Well enough, in fact, to talk with his mother and take a bath. He then told his mother he felt sleepy (which would not be inconsistent with an eventful day at the pool) and his mother tucked him into bed. But when she went to check on him a little while later, he was unresponsive. Although Johnny was rushed to the emergency room, doctors were unable to revive him, and he later died. Ten-year-old Johnny was a victim of the relatively rare phenomenon called dry drowning or secondary drowning. According to statistics from the Centers for Disease Control, of the 3,600 people who drowned in 2005 (the most recent year on record), 10 to 15 percent of those deaths were classified as dry drowning. Dry drowning occurs when a person inhales a small amount of water or other liquid. The inhaled liquid then causes a spasm of the airway, called a laryngospasm. The spasm creates a partial vacuum and even the hard, rapid breathing which results cannot adequately fill the lungs. Dry drowning can occur after a child inhales water at bath time, or if they aspirate any other liquid into their lungs. Parents should be aware of the symptoms of dry drowning because although it is rare, the series of events which follow can prove deadly if not recognized and treated immediately. Doctors say that inexperienced or first-time swimmers may be at a higher risk for dry drowning, along with children with underlying breathing/lung disorders (such as asthma). Signs and symptoms of dry drowning include persistent coughing, shortness of breath, pain in the chest or a marked change in mental status following the inhalation of water or an accident while swimming, bathing or drinking (child seems foggy or unusually lethargic). Parents should note that they might not have observed their child inhaling the water. If you are concerned about your child or suspect dry drowning, seek immediate medical attention or call 911 right away. If caught early, doctors say that dry drowning can be treated. Doctors can administer oxygen, which is supplied to the lungs. When the breathing process is restarted, children can heal from the trauma/damage to their lungs. Do not leave your child unattended around water. This includes swimming and wading pools but also includes leaving a child unattended in a bathtub or bathroom. Because kids can drown in as little as one inch of water (most commonly babies), parents should supervise them around all water (buckets, sinks, etc). If you are using a wading pool, empty it as soon as you are finished and store it upside down so it doesn’t collect water. Don’t store buckets or other containers where children can reach them. Child safety experts suggest using child safety locks on bathrooms and utility rooms (anywhere kids could enter and turn on the water). Also, consider using child safety locks on toilets. Take a certified first aid course which teaches you how to perform child and infant CPR. If you know how to handle an emergency it will not only give you peace of mind, you’ll be more likely to react swiftly, calmly and appropriately if a child is injured. If you are a pool owner, safety experts suggest installing four-sided fencing with a self-locking gate. This has been proven to decrease drowning deaths. Above ground, inflatable pools also need suitable safety fencing. Make sure pool or hot tub/spa drain covers are not damaged, cracked or missing parts. Have appropriate life-saving devices (floats, reaching poles, life rings, etc) within easy reach near a pool should an emergency occur. If someone in your family has been injured in a pool accident and would like to begin understanding your rights, please call the experienced personal injury attorneys at Hardy, Wolf and Downing to schedule a free and confidential evaluation of your case. Attorneys in our Lewiston, Portland and downtown Portland law offices are available to answer your questions regarding your accident and will put our expertise and experience in the field of personal injury law to work for your family. Our personal injury attorneys provide our blog as a service to our clients. They are meant to be purely informational.